ModeKnit Yarn – Page 3 – Make Something Nice! Spring means many things to many folks. In Texas and Kansas, it means tornadoes and tulips. In Minnesota, it means snowfall generally reduced to 3″/day instead of the Winter average of 8″/day. For Kathleen and me, Spring means the start of our BUSY-AS-HELL season. We are busy. And we love it! In the past 4+ years, ModeKnit Yarn has grown steadily, and the number of shows we do each year grows as well! We’re doing some brand new (to us!) shows this year, and returning to some of our favorite stomping grounds, too. Some of my classes at Estes Park are already sold out, but two of my most FUN classes still have openings; Knitting With Wire and Charted Entrelac. Both of these are excellent for ALL skill levels, and will introduce you to techniques that transcend the subject matter and can be incorporated into your every day knitting! If you’ll be in Colorado or missed out on my classes at Yarn Fest, this will be a GREAT chance to take a class and enhance your knitting skills! This weekend, May 5-6, Kathleen is in York, Nebraska for the Mid-Plains Fiber Fair. It’s our first time at this show, and I’m sad not to be there, but thrilled that Karen (our erstwhile booth helper and cheerleader) will be traveling and working along with Kathleen! May 12-13 we’re in our backyard, back in Minnesota for Shepherd’s Harvest! This yearly event is one of our favorite fiber shows, and never fails to bring the fun and fiber for the whole family! Come and visit us in Booth B, and leave room for Kettle Corn! We’ll have some beautiful new colorways to show off, and it’s always fun to take mom out to look at the sheep and goats on Mother’s Day! Immediately after Shepherd’s Harvest we load up the trailer and head back on the road for fiber shows in Kentucky and Ohio! More about those next week, but we’re working on adding a trunk show at 614 Studio in Columbus, OH in the week between the Kentucky Sheep & Fiber Festival and the Great Lakes Fiber Show. on all of the details of our fiber travels! It’s Time for our Winter Sale! Our annual winter sale is HAPPENING NOW! Use code winter2018 at checkout to take 20.18% off your total purchase through January 31st! Everything (except memberships to the Cassini Yarn Club) is on sale. Have you been hankering for a new jacket? Our Garter Stripe Jacket Kit is now available online! This cozy jacket is always a hit at fiber shows. Kits are available in a range of sizes starting at just $96.00 ($76.62 during the winter sale if you use code winter2018). Shown in Lyanna Blue, Gilmarite, Pewter and Hydrangea FLOW. Create your very own signature jacket by choosing four different colors for your kit; three non-FLOW colors and one FLOW colorway. The finished garment runs large, so choose one size smaller if you need to. Brahmin Moth Shawl in Sapphire, Chabazite and Bristol Pool. What about a new shawl? Our Brahmin Moth Shawl is a fun project. A series of large miters and slip stitches and lots of garter stitch make this an adventurous (and intermediate) knit. 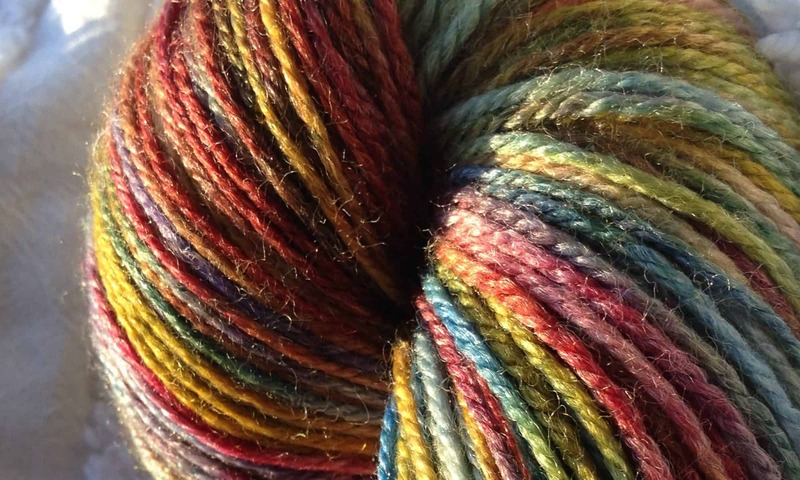 For spectacular results chose three colorways; two colorways that you love, and one colorway that ties them together. Cowl anyone? Our Slippy Cowl will add a pop of color to any dark winter day! Choose two highly contrasting colors of Worsted or DK to achieve the colorwork effect. The secret is you’re only knitting with one color at a time! If you can knit and purl, you can make this cowl! Do you crochet? Our Spinny Chullo kit is for you! This chullo is an excellent crochet adventure. Written for an intermediate crocheter, an adventurous beginner could work it as well. Choose two contrasting colors and get started on your hat! Remember, use coupon code winter2018 for 20.18% off now through January 31st!